Back in 2013, we blogged about the “boodle fight” at US Embassy Manila (see US Embassy Manila Hosts a “Boodle Fight” … or Fine Dining Combat Without the Flatware). This week, the US Consulate General Chennai posted its first video in the Madras Week video series — which highlights everyday rhythm of Madras culture, food, and traditions. The clip below shows how you eat your meal with your hands. Communal dining similar to the “boodle fight” but not quite as up close and personal (you get to have your own banana leaf as plate). Also read Simple formula keeps this mess afloat and The Rules For Eating With Your Hands In India, Africa And The Middle East. Bliss is an emotional state that is characterized by perfect happiness (feelings of enjoyment, pleasure, and satisfaction). The State Dept announced last month that it intends to solicit replacement services that are currently being provided by KBR under the LOGCAP Program and services provided by DLA. The replacement services will be called Baghdad Life Support Services or BLISS for short. Bliss in Iraq? Holy molly guacamole, who would come up with a name like that? The selected contractor will be required to provide life support services to persons and organizations that are determined to be performing missions or functions in support of the Chief of Mission, including: COM personnel, selected civilian agencies, military units, and authorized contractors who directly support the COM. Current life support for these sites is provided by the U.S. Army Materiel Command’s “LOGCAP IV” (Logistic Civil Augmentation Program), Defense Logistics Agency (DLA), and Army Sustainment Command (ASC) Green Equipment Maintenance contract. These contracts are due to end in December 2013. The State Dept’s intent is to award this contract prior to May 1, 2013 and transition to a new DoS contract no later than September 30, 2013. According to supplemental documents, following the award, the incumbent will require a minimum of 60 days to demobilize. The transition off of the DLA supply chain contract for food will be addressed in the formal RFP. Background: The mission of the United States Embassy in Baghdad is to represent the United States of America to the Government of Iraq (GOI). The U.S. Ambassador (Chief of Mission (COM)) is the President’s representation to the GOI. The Embassy is located in the International Zone (IZ) in Baghdad. The compound consists of 104 acres and is the largest U.S. Embassy in the world. The Embassy requires life, logistics, operations and maintenance services to support the Embassy, other locations within Baghdad and five or more diplomatic posts and facilities currently located in the provinces of Basrah, Diyala, Erbil, Ninewa and Tamim. This list may be modified during the life of this contract. The main dining facility cafeteria area on the Embassy Compound is a 3,000 square meter facility that currently has a feeding and seating capacity of roughly 2,500 personnel. This area does not include the various refrigerated vans and containers used for storage of frozen, chilled and dry storage of food, or supplies. […] Additional feeding capacity projects are being contemplated to accommodate personnel surges. The maximum occupancy on the BEC is 2600, while Camp Condor houses 1129 and has its own dining facility. Local Nationals (LNs) are only entitled to lunch meals, not breakfast or dinner. The largest feeding requirement occurs during lunch time during week days as LN direct hire personnel are entitled to eat lunch meals. Three snack bar operations located on the Embassy compound (1 within Annex 1, 1 in Annex 2, and 1 in the Chancery) alleviate the feeding demand during the lunch meal at the cafeterias. Two of the snack bar operations serve only cold sandwiches and hot soup. The Annex 1 snack bar is equipped with a grill that provides a hot entre lunch item 5 days a week: Sunday through Thursday. This is a 350-acre State Department-managed facility located next to the Baghdad International Airport (not within the IZ). BDSC houses 41 individual agencies or groups, totaling approximately 1600 personnel. The BDSC dining facility is a 2244 square meter facility that serves 1800* residents and transient personnel three meals per day. A grab-in-go (soup and sandwich bar) is open 14 hours daily (0830 – 2230). The dining area is 1182 m2, kitchen 531 m2 (warehouse 531 m2, which is connected to the kitchen) and serving lines 55 linear meter. This is a 2760-acre compound with a an office building, gym, warehouse, motor vehicle center, 800-plus containerized housing units, a fire station and other facilities. The EDSC DFAC is a 915 square meter facility that serves 790 residents three meals per day. Located on 53 acres, with the Consulate General building occupying 119 acres and the Air Hub occupying 34 acres. The Basrah dining facility currently serves 790 residents three meals per day. For those four posts alone, and those are not all the posts we have in country, the USG need to serve 17,640 meals day! But they gotta eat. We’re looking at the plan for local sourcing next but we’ll post that separately. Did State anticipate that crossing the borders now manned by Iraqis would be messy? Did they anticipate that the Iraqis would want to approve/deny entry of supply convoys but that the government may have no process in place, but will never admit it? Did State anticipate the multiple layers of bureaucracy required to approve entry of frozen chicken wings, and salad bar weeds trucked in from Kuwait? Is there a new SOP on what to do if the Iraqi guards do on chay break the rest of the day while supply trucks gets barbequed under the sun? 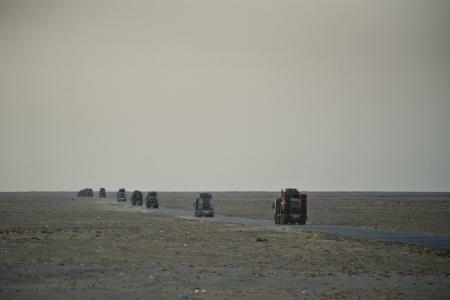 A U.S. Air Force airmen from the 70th Medium Truck Detachment lead a convoy through Iraq with a load of equipment and supplies Oct. 30, 2011. With less than five miles left before crossing the Iraqi border, the convoy of 43 vehicles traveled 1,100 miles in 7 days, hauling equipment out of the country as part of an effort to meet the deadline for the U.S. military to transition out of Iraq. While the “impediments” imposed by the Iraqi Government hardly surprised us, we were quite stumped by the number of trucks running the food convoys. Please note that we’re not saying our folks should not be feed. It’s us — we just can’t begin to imagine a hundred trucks end to end in a convoy, much more 600. Every day. Everything that has to do with our continuing project in Iraq is super-sized: the embassy is a giganotosaurus, the embassy staffing is over the top (no matter the “right-sizing”), the front office has one ambassador plus 5-6 assistant ambassadors, there are 350 police trainers, no 190, 100, 50, oh, who knows? So 8,070 feet of food trucks lined up end to end should be a normal sight, considering the location, right? Not that anyone would put them end to end, that would be much too tempting for the fireball guys. Except when the trucks are stuck end to end at the border crossing. The report did not say if the “impediments” have been removed, or what other food sourcing options (MREs excepted) have been planned or implemented. U.S. Embassy Manila Launches Mini-Series – Kwentuhan Tayo, Pinoy-Style, and There’s Baluuut! Last week, the US Embassy in Manila launched a new video mini-series on YouTube, called Kwentuhan Tayo, Pinoy-Style! (roughly means let’s tell stories or something like that). The introduction video features six American diplomats speaking about their lives in the Philippines in Filipino. This is reportedly the first Filipino-language video series to be offered by the Embassy. We should note that Ethnologue lists 175 individual languages in the Philippines, 171 of which are living languages while 4 no longer have any known speakers. According to the country’s 2010 census, it has a total population of over 92 million of which some 22 million or 24% are Filipino speakers. More than three quarters or 76% of the country speaks a language other than Filipino. Dina, a staff aide to the U.S. Ambassador who learned Filipino from her grandmother as a young child. The most courageous of this crew is probably David, shown above eating balut (in the haute cuisine category cooked adobo style? with cutlery). He joins the likes of Anthony Bourdain in a culinary adventure known as eating balut with a spoon or hot vit lon in Vietnam and shown here in Bourdain’s show Cook’s Tour. Fetal treats, indeed! If that’s not enough to make you cringe, we need to inform you that balut is numero uno in Cracked.com’s 6 Most Terrifying Foods in the World. The ever optimistic website claims that if marketed properly, these eggs could be a “damn good motivator.” Their rationale? “When you’ve looked death in the face at breakfast time, what the hell else can the day throw at you?” Which actually makes sense when you come to think of it, right? No, not the part about having it for breakfast. Oh — and please add “he should be promoted at the first opportunity.” Um…. because EERs always say that. Except for the garlic, that sounds like vampire food. But write and let us know if you try it, please?